How do you make salad better? You put BACON in it! Yes, bacon! Don’t worry, you can thank me later..
Heat 1 tbs of olive oil in a pan over a medium heat, add bacon and cook, stirring occasionally, for 5 minutes or until browned. Remove pan from heat and drain bacon on paper towel. Place McCain Peas and all salad ingredients into a serving bowl and toss well to combine. Whisk olive oil with lemon juice, white vinegar, Dijon mustard and finely chopped mint leaves. Season with salt and pepper and toss gently through salad. 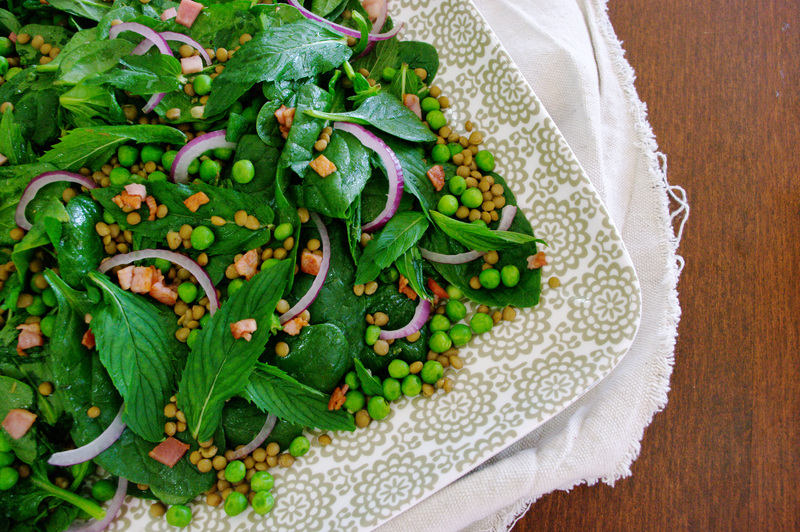 This salad is one of my go-to meals for a quick, simple and tasty weekend lunch. Oh, and it is excellent when served with a Sauvignon Blanc! The smoked chicken, plump peas and sharpness of the Parmesan taste sublime together; and paired with the fresh crunchy lettuce and a creamy dressing, makes a fantastic meal that tastes as impressive as it looks. Plus, the minimal effort is a big tick. You can either buy smoked chicken, or smoke your own. However, leftover chicken will also work a treat. Place McCain Baby Peas, cucumber and red onion in a bowl and toss to combine. Place whole egg mayonnaise, honey and lemon juice into a small bowl and use balloon whisk to mix until smooth. 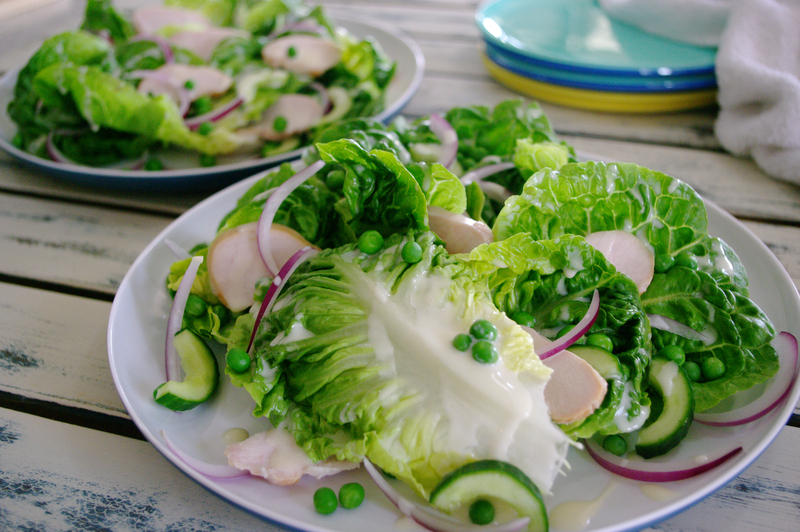 Divide cos lettuce leaves evenly among serving plates, top with the pea mixture and slices of smoked chicken breast. Drizzle with the dressing, top with flakes of Parmesan and serve immediately. Tip: serve with fresh bread or garlic pizza. I don’t say this often or lightly but I hate brussel sprouts. I always have. Brussel sprouts and squash are the only things I don’t like. In saying that, I’ll still eat them, but I don’t enjoy them. Huh! I showed them! After discussing brussel sprouts with my husband, I said I didn’t like them, he stopped in his tracks, starred at me and exclaimed that was the first time he has ever heard me say that I didn’t like something. He was shocked at how I could hate something that he had such found memories of eating, coated in butter, cheese or white sauce. I explained that in my family they were served au natural and complimented by their cabbage-like flavours any child it set to love. If something is covered in butter, cheese or white sauce – chances are I am going to enjoy it. I decided to give brussel sprout another crack. I sat down, pen in hand and created my ‘perfect’ brussel sprout dish – spicy chorizo, sharp parmesan, zesty lemon and nutty chickpeas. drool. I then decided to invite over some brussel sprout loving friends so they could provide an honest opinion on the dish. I wanted to know if it was good, even if I didn’t like it. I set out with my shopping list and stumbled upon a delightful discovery in my local Woolworths, Springbrook Valley Organic Chorizo. Made in NSW, with premium pork, no nasties, no preservatives and 100% delicious! You MUST try it. Once home, I got cracking and whipped up my flavour-loaded brussel sprout ‘salad’… and you know what? I loved it! 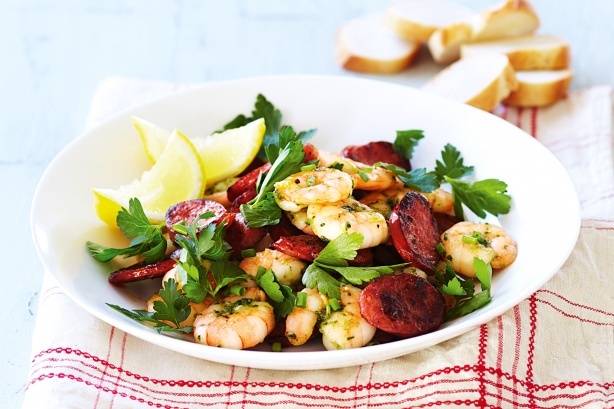 2 Springbrook Valley organic chorizo – sliced into rounds – trust me, you will taste the difference! Heat 1 tbs of oil in a large pan over a medium heat. Add chorizo and fry, turning for 1 minute or until brown. Add McCain Brussel Sprouts and chickpeas, cover and cook for 5 minutes, stirring occasionally. Meanwhile, using a vegetable peeler, peel the rind from the lemon, finely slice and reserve. Juice the lemon and reserve. Add the remaining olive oil, mustard, lemon rind, lemon juice, garlic and honey to a small bowl and mix to combine. 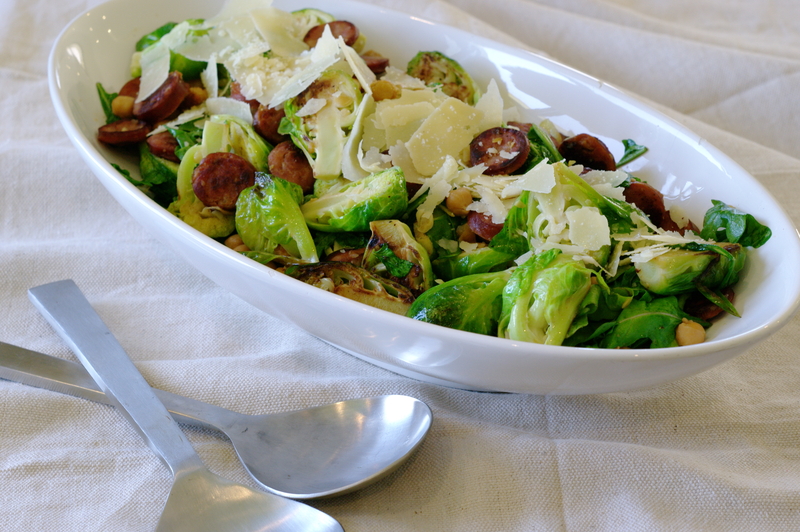 Remove brussel sprout mix from heat, season with salt and pepper to taste, toss with fresh rocket leaves and dressing. 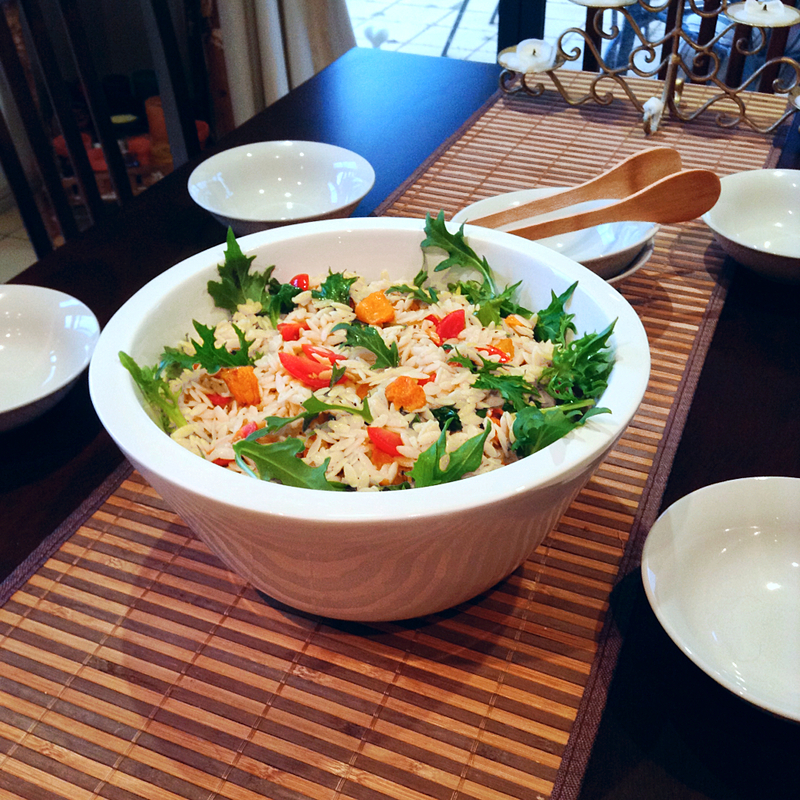 Place salad in a large serving platter and top with grated parmesan cheese.